The only problem - the deal is only good for today, Saturday, August 27th in all Fry's retail locations. 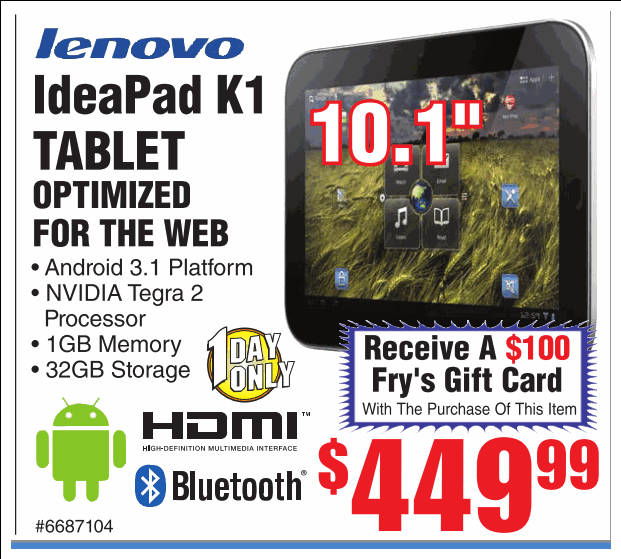 Unfortunately, the Frys.com IdeaPad K1 page has no mention of the gift card, so if you want Lenovo's first Android tablet in your hands tonight, you're going to have to plop in your car and drive to the nearest mall with Fry's in it (hey, that's a good thing - I like to think of Fry's as a magical and happy place - what Disneyland?). As you can see, the K1 is no Tab 10.1 in weight and thickness, but then again, it doesn't cost as much either. Before you buy, though, I would advise you to do some research - read Amazon user reviews first, then see what Engadget had to say.